There are nearly as many styles of architecture throughout the streets of Asheville as there are buildings. No doubt, Asheville was dubbed the �Paris of the South� in the early 1900s for establishing itself as an artisan city with unique style and architectural talent. Asheville has developed through a history of migration to the mountains of Western North Carolina. The variety of Asheville's architectural styles celebrate its past and illustrate a lasting structural image of the community's diversity. The earliest settlements known to this area were American Indian hunters who set up temporary villages throughout the Blue Ridge Mountains. By the early 1800s, Colonial subsistence farmers had populated Asheville and developed more permanent residences of almost exclusively log construction, with the exception of a few brick buildings. A new era of development and settlement came as a result of the construction of the Buncombe Turnpike in 1827. This road paved the way for a new stream of visitors to Western North Carolina and with them a new definition of style, fashion, quality and worldliness. The development of transportation systems facilitated Asheville's long and fascinating history of architectural development. In the years after the turnpike opened, businesses were established along the roadside; many built with durable materials like log construction and heavy-timber framing. The arrival of wealthy vacationing visitors brought more extravagant tastes and the ability to afford them. Summer tourists, especially landowners from South Carolina and Georgia, began to build their vacation homes in Western North Carolina. Greek Revival and Federal designs, commonly seen on southern plantations, were built true to their fashion but reflected the wilderness of the mountains. Until the railroad arrived in 1880, Asheville was still a country village where farmland and forest found its way to the front step of the county courthouse. Asheville became the crossroads hub for the emergent railroad, and began to truly grow as an urban center, while Western North Carolina headed into an era of unprecedented development and prosperity. In the three years following the arrival of the first train, Asheville 's population nearly doubled. City residences, factories and buildings of all kinds were constructed with equal speed. In the late 19th century Asheville boomed as a new destination for well-to-do tourists who preferred modern style to rusticity. With the development of lodging like the original Battery Park Hotel and the Kenilworth Inn, both built in Queen Anne and Victorian vernacular styles, their desires were more than accommodated. No desire was more lush and extravagant than that of George Washington Vanderbilt, who came to Asheville to erect his retreat-home on 125,000 acres, in what he called the Biltmore Estate. In 1889, architect Richard Morris Hunt and landscape architect Fredrick Law Olmstead teamed up to design and construct the Biltmore House and grounds to rival any of the great French Chateaux that inspired it. With the success of his Biltmore Estate, Mr. Vanderbilt hired Hunt to construct a variety of buildings in the style of a manorial English village, including the All Souls Episcopal Church and Parish Hall, the Southern Railway Passenger Depot (Biltmore Depot) and the Biltmore Estate Office. Following Hunt's death in 1895, Vanderbilt hired Hunt's supervising architect, Richard Sharp Smith, to continue the development of the manorial Biltmore Village with various public buildings, cottages and commercial buildings. These buildings echoed Hunt's template of brick, pebbledash (a type of stucco featuring coarse stone) and heavy timbers creating a recognizable �Biltmore Style� which became the pattern for Smith's signature style. 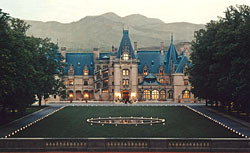 The legacy of the Biltmore House and its construction was the international attention it focused on Asheville and Buncombe County. Artisans and craftsmen from all over the United States and Europe came to Asheville to work for Vanderbilt, many of whom stayed and contributed their skills to other projects. One prominent artist who came to work on the Biltmore House was Spanish-born architect, Raphael Gaustavino. His most famous contribution in Asheville is the Church of St. Lawrence, featuring a self-supporting elliptical dome, 58 by 82 feet, perhaps the largest in America . R. S. Smith continued to contribute to Asheville with numerous commercial, civic and religious buildings, including the Young Men's Institute Building and the African American Masonic Temple. Smith's most abundant contribution was in residential development. Entire blocks, streets and neighborhoods scattered throughout the Montford and Chestnut Hill Historic Districts were designed by Smith with his own customized use of the then popular Queen Anne style. 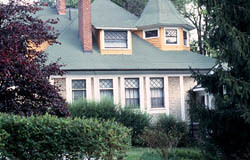 Much of the residential development in Asheville at this time illustrates styles with more grounded features and natural influences. The Arts and Crafts movement, which was inspired by nature, local materials and the expression of skill, thrived in Asheville. Exaggerated sloping roofs, big open porches, ornamentation that expressed craft over embellishment and an overall horizontal form are witnessed throughout the city, from a small one-bedroom bungalow to a grand resort hotel with 500 rooms. Asheville's growing reputation as a health retreat promoted the development of luxury inns, resorts and associated cottages. During the 1890s, William Green Raoul, a leading railroad executive; Bradford Gilbert, a renowned architect in New York City; and Samuel Parsons, Jr., an important landscape architect, began construction of Albemarle Park, an assembly of inns and residences featuring the Manor along Charlotte Street. Over time, finely designed residences were built along this corridor with Neoclassical, Colonial Revival and Queen Anne features. In 1920 Raoul sold the Manor and Cottages to Asheville's next large investor, Edwin W. Grove. 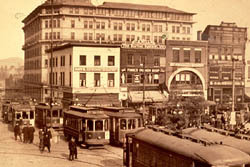 Grove came to Asheville in 1900. With him he brought an idea for a grand yet rustic mountain-lodge, an inn built to resemble a lodge in Yellowstone Park. Grove began developing the surrounding Grove Park neighborhood at the foot of Sunset Mountain in 1907. 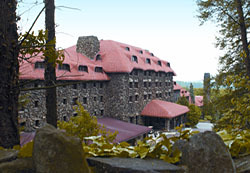 By 1913, he had finished the construction of his Grove Park Inn, built of massive boulders reinforced by concrete and capped with a burnt-orange tiled roof. Grove purchased the surrounding area and sold it off for more residential development creating a stock of remarkable and fanciful dwellings, while the roads approaching Grove Park became the setting for a number of significant buildings. In 1922, Grove announced plans to demolish the existing Battery Park Hotel and the prominent bluff it stood on called Battery Hill, and raise a grand tourist center in its place. Grove recruited Asheville architect, Charles N. Parker to level the hotel, lower the hill by 70 feet, and construct the Grove Arcade, a commercial shopping center in Neo-Tudor style with Gothic style details. Grove's death in 1927 halted the construction of a 19-story tower to top the shopping center, but not before the spectacular terra cotta arcade was completed, which housed one of America's first indoor shopping plazas. A new Battery Park Hotel was built on the leveled site. The 1920s marked even stronger growth of Asheville as an urban center of government, commerce and tourism in Western North Carolina. More than 65 buildings were erected in downtown Asheville during the 1920s, including the Jackson, Kress and Flat Iron buildings. The visual contrast between rural Buncombe County and urban Asheville grew sharper during this period, and is permanently symbolized by Douglas Ellington's 1928 Art Deco City Hall and the conservative Neoclassical County Courthouse built the same year. The Art Deco movement in Asheville continued well into the middle of the century with the Federal Courthouse, the Wick & Greene building (originally a gas station) as well as Douglas Ellington's other works, including the Asheville High School, First Baptist Church and the S&W Cafeteria. The Depression of the late 1920s and early 1930s hit Asheville hard. Western North Carolina's largest bank, the Central Bank Trust Company, folded. Fortunes vanished, families lost their homes, and the city soon defaulted on its overwhelming debts. Rather than filing bankruptcy, the City of Asheville chose to pay off its debt, taking nearly 50 years to accomplish. Investment in new construction all but ceased. The absence of building activity in Asheville had the effect of preserving several buildings from the wrecking ball, enabling many to survive today. The next 50 years witnessed slow but steady growth in Asheville. An emphasis on clean lines and simple form evolved in part from the area's stressed economy, but also in accordance to the change in national and international trends towards Modern architecture. Gradually, buildings were being constructed in styles reflecting the period fashion favoring streamlined curves and geometry over heavy ornamentation. At the forefront of this transition was Anthony Lord's 1939 Asheville Citizen Times Building. This era also produced Asheville 's tallest building, the 1964 BB&T Building and other prominent works including the I. M. Pei Building, the Wachovia Bank Building and the First Union Building. Asheville is a city of rich architectural styles, ranging from Victorian to Arts and Crafts, from Art Deco to Modern design. Although still endearingly called the "Paris of the South� now and again, Asheville has matured as a unique destination in built landscape worthy of its own identity and acknowledgements. Asheville's diversity in architectural style reminds us of its distinct cultural upbringing, ever integrating the sophistication of modern styles with the charm of mountain life. Historic Resources Commission, An Architect and His Time, Richard Sharp Smith. 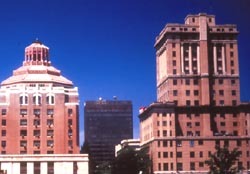 Historic Resources Commission of Asheville and Buncombe County, 1995. Swaim, Doug. Cabins & Castles, The History Architecture of Buncombe County, North Carolina. City of Asheville-Buncombe County, Department of Cultural Resources, Division of Archives and History, 1981.